Guava is very common in Asian countries. This attractive fruit is a real storehouse of nutrients. If it is “An apple a day keeps the doctor away” in Europe and Americas, it must be “A few guavas in the season keeps the doctor away for the whole year” in the Indian Subcontinent and places where guavas grow. Its scientific name is Psidium Guajava. Diarrhea &amp; Dysentery: Guava is very rich in astringents (compounds those make your gums feel tighter and fresh after you chew guava leaves or eat a raw guava or use some toothpaste) which binds up loose bowels in diarrhea. These astringents are alkaline in nature and have disinfectant and anti-bacterial properties, thus help cure dysentery by inhibiting microbial growth and removing extra mucus from the intestines. Further, other nutrients in guava, such as vitamin-C, Carotenoids and potassium strengthens and tones up the digestive system and disinfect it. 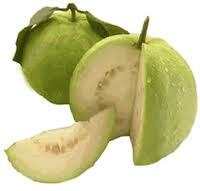 Guava is also beneficial in gastroenteritis due to reasons stated above.